Tooter Boatman, one of Huelyn Duvall's rocking 50's friends recorded some great boppers of which only a few saw the light of day Twinkle Records from Stephenville, Texas. Several reissues of mainly the same recordings were made available in the past years. Only recently we discovered some really great recordings by him on several rehaersal tapes. Not much is known about Tooter except that he missed a finger and that he died in a car accident in 1959. His group The Chaparrals included some members who later became more famous like Clayton Glover, who became a much wanted drummer in las Vegas, Billy Bland played guitar, Charlie 0' Bannon, who was an exceptional Floyd Cramer-type piano player and Billy Graham, who later became Glenn Campbell's bass-player. There was a time that Bob Milsap also played in the band. He went to Nashville and became a studio guitar player, an outstanding songwriter, published many hit songs including the giant "You Need Me" and was also recognized as an outstanding producer. He now lives in Missouri writing science fiction books. Bob Milsap was discovered by Danny Wolfe when he was 16. The Chaparrals also recorded for the Texas Rebel label and for Roulette Records. 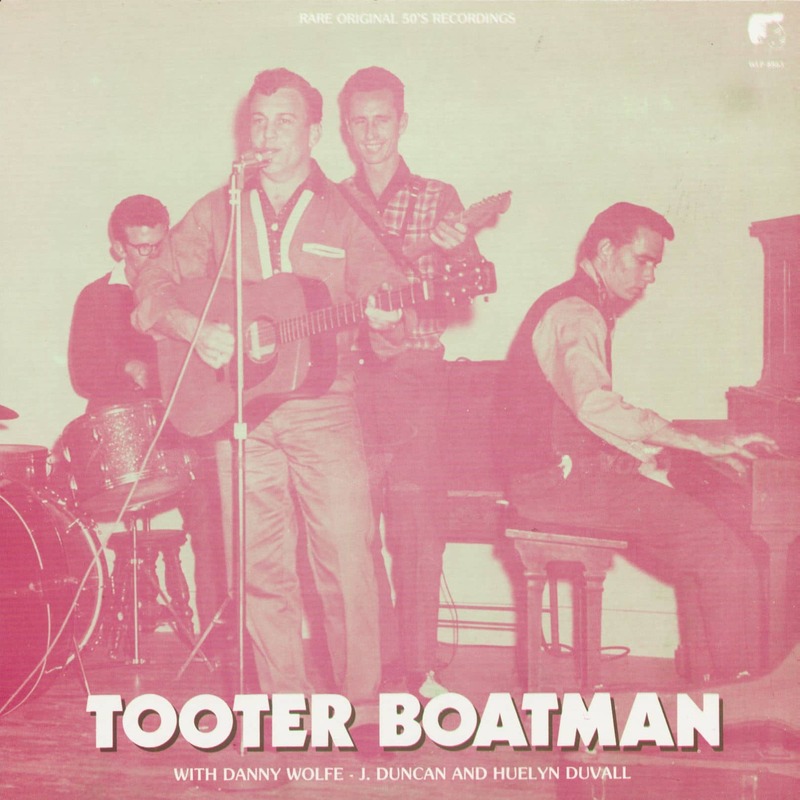 Johnny Duncan happened to be around when Tooter an Huelyn Duvall were rehear-sing some material. That is how "Baby make a move" got recorded. Other issues by him were released on Columbia. Danny Wolfe, who is responsible for most of the recor-dings and sound is also presented here with "Isabella". As composer he did very well by writing many great songs. "Modern Romance" by Sanford Clark was written by Danny Wolfe as well as one of John D. Loudermilk's hit records "Susie's House". To complete this LP we have included two more tracks by Huelyn Duvall of whom you can find more on WLP 8864 in these series. We have some of the tracks not faded out at the end of the recording to give you 100% of this great stuff. 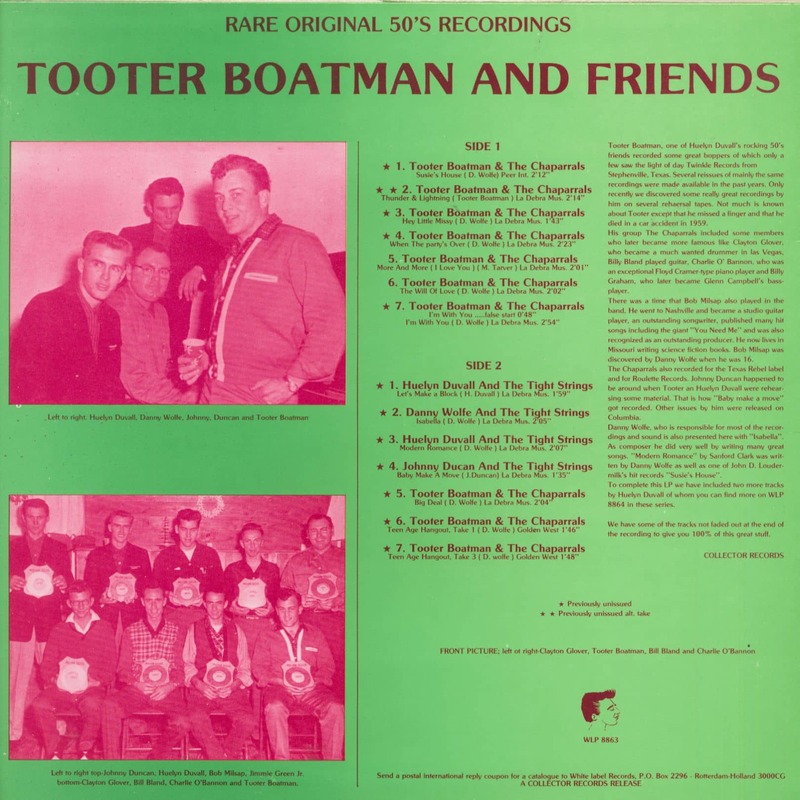 Customer evaluation for "Tooter Boatman And Friends (LP)"